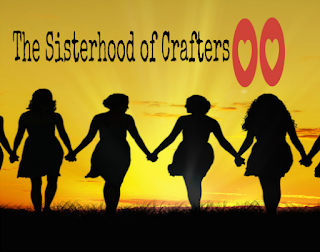 It's time for another challenge from The Sisterhood of Crafters. It's a biweekly challenge and so much fun. I do hope you'll come join us and share your creativity. So, let's get on with this week's new challenge. Hosting this week is Terri and she has us thinking about the boys and men in our lives. So, whether it's a son, grandson, grandfather, uncle, nephew or a friend, masculine cards are the ticket. You know I just had to play with those Distress Oxide inks again. The background was done using a paint brush to apply the colors. I just kept adding layers until I had just the look I wanted. One thing to remember, though, is to dry each layer of color as you go so you don't wind up with a muddy background. That is the voice of experience talking even after watching Tim's video. Some lessons just have to be learned the hard way. For all the challenge details and to share your project at The Sisterhood of Crafters Challenge, click the image below. 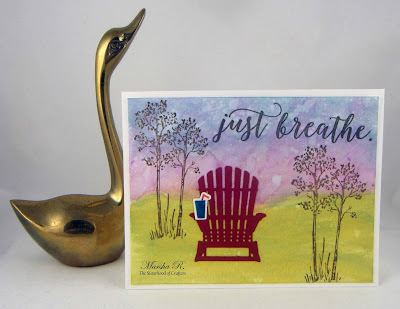 Fabulous card and I love the background...I only own one pad of distress inks as I told myself I wasn't going to add ANY more inks, but as I keep seeing all these backgrounds using it, I think I have been swayed..lol!! Thanks, Diane! I can't wait until I can get all the colors that are now available. Beautiful card and love how you made the beautiful sky in the background. Those two stamp sets really look great together. Thanks for the inspiration! Thanks, Debbie! Two of my favorite sets. Great use of the inks for the background. And I love the drink you placed on the chsir! Thanks, Nancy! I love those oxide inks. Beautiful background and card; so very peaceful! Thanks, Gwendolyn! I used a wet brush. But be sure you dry each application of color before adding another color.